Gender analysis is a process of considering gender and gender inequalities when analysing data and program planning. It can assist in ensuring the creation of gender equitable and inclusive communities. WHIN has developed three resources to assist organisations to apply a gendered lens to their work. 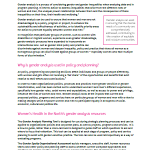 This resource provides a brief introduction to key concepts of gender analysis and the rationale for applying a gendered lens to all plans, policy and practice. 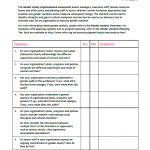 This tool is designed for use during planning processes and can be applied to organisational policies, corporate plans, projects, programs and services. It guides staff on which questions to ask at each stage of program, policy and service planning. This resource assists staff including senior managers and human resources teams to assess whether current workplace policies and practices are gender sensitive. 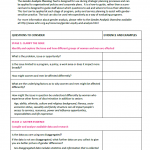 The checklist can be used to identify strengths and gaps to inform work plans. To understand the work that underpins the resources on this page, visit the Gender Equity, Health and Wellbeing page in the ‘Current Work’ section of our website.